Carry sidearms with comfort and convenience wearing the Universal Nylon Omega VI Ambidextrous Drop Leg Holster from Blackhawk! Designed to hang comfortable from the hip while resting securely against the thigh, the Y-harness suspension system distributes weight evenly. 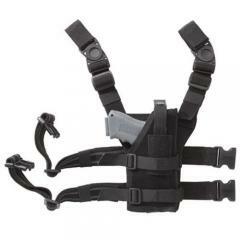 The elastic leg straps ensure the holster stays firmly pressed to the thigh and rubberized strapping strips provide additional support and increased wearer comfort. A flexible holster pouch allows for near universal pistol compatibility, with enough space for holstering pistols fitted with laser modules and/or threaded barrels. The adjustable thumb break provides Level II security retention while the added hook and loop straps provide further gun security. Constructed from 500D CORDURA® nylon and scuba strapping, this holster will maintain its shape in any environment. Service was excellent and the product was exactly what I was searching for. Yes, the holster is designed to fit most medium to large frame autos.